The Boeing 707 represented a turning point in transportation history, its introduction marked the true beginning of a new age in travel. The 707 changed the way people thought about travel, it also changed the aircraft industry. Boeing had never enjoyed commercial success with its previous airliners, but the 707 gave birth to a "family" of transports that have since dominated the global airliner market. Funded with $16 million of Boeing's own funds, the new four-engine, 600 mph, 160-seat jet transport first flew on July 15, 1954. First ordered by Pan American in 1955, it went into transatlantic service between New York and London in 1958. The almost 950 Boeing 707's sold set a new standard for travelers and Boeing now became a household word in the exciting new jet era. 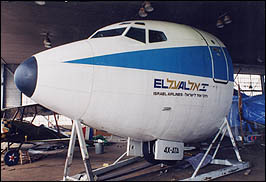 This particular Boeing 707 nose section (4X-ATA) is from the first jet operated by El Al Israel Airlines. It was delivered in May 1961 and had the honor of establishing two world records. On June 15, 1961 during the return portion of its scheduled flight from New York to Tel Aviv, 4X-ATA flew 5760 miles nonstop - a new distance record for a scheduled commercial flight. Accomplished in 9 hours, 33 minutes, this flight also set the speed record for a New York (Kennedy Airport) to Tel Aviv flight. 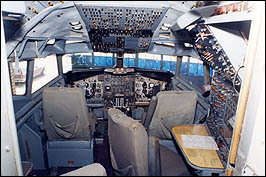 4X-ATA served for 23 years, retiring in 1984. In all it carried over 2 million passengers more than 36 million miles, equivalent to circling the world 1450 times, without incident.